Easter is one of the biggest celebrations of the year and many people celebrate for different reasons. Some people celebrate Easter to get their kids picture taken with the “Easter bunny,” participate in a huge Easter egg hunt that happens once a year in a local community, or maybe just for the candy. All of these things are fun especially for the kids, but don’t represent the true reason for Easter. It’s so easy to get excited about Easter so that we can see our kids enjoy an egg dash, but its important we teach our kids the true meaning of Easter as well. The true reason for Easter is to celebrate the life, death, and most importantly, resurrection of Jesus Christ – my personal Lord and Savior! So this Easter, I’m making an effort to incorporate Christian Easter crafts and activities for Resurrection Day and wanted to share a list for some of the best Easter crafts/activities that I could find–so that you can do them with your family this year! Whether you’re a teacher looking for Christ-centered Easter crafts, a Sunday school teacher looking for a new empty tomb craft, or a parent looking for “he is risen” craft ideas, you will find it all in this article! Memory Cross has several creative Christ-centered crafts and printables that will teach your child the Easter story in the most unique way. 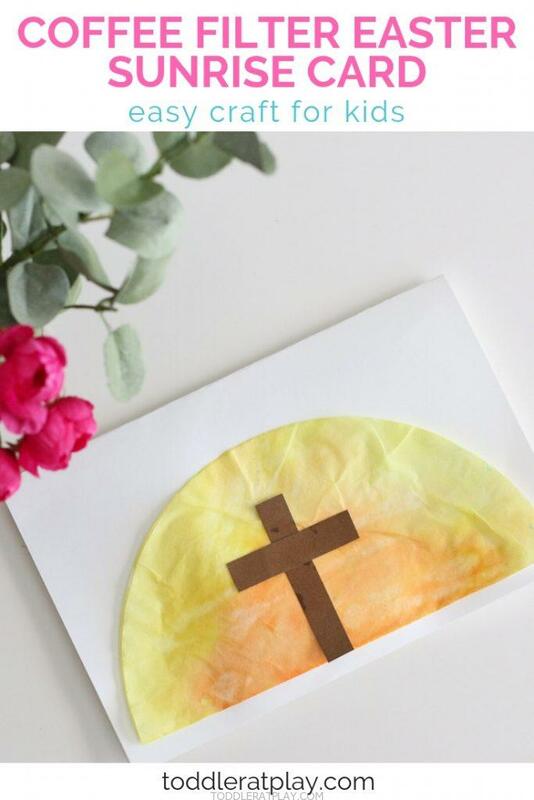 Coffee Filter Easter Sunrise Card – Veronika from Toddler at Play, came up with a simple Easter card making activity for kids. While your child is creating their own card, it’s the perfect opportunity for you to tell the story about Jesus and the true reason we celebrate Easter. For my non super crafty mamas, this is perfect for you to do with your little ones. It also doesn’t require many craft materials, which is a bonus! I know my kids will enjoy this one! DIY Easter Wreath Cross – I (from Zaneta The Work At Home Mama) recently created a DIY Easter Wreath Cross. When I wrote this article, I wanted to include written Christian DIY Easter wreath activity tutorials but to my surprise, I only found one. The other wreaths were for purchase only, which motivated me to create this Easter wreath – so that you can follow along and create a DIY Easter wreath cross for your family. This front door Easter wreath is great to do with older children, but it is also a perfect opportunity to share the story of Jesus with younger children while you are making it! Coin-Covered Cross – Trish from Mom On Timeout, came up with an awesome way to decorate a wooden cross using coins. This concept is to teach your child how Jesus paid the ultimate sacrifice for our sins on the cross. I LOVE this idea and will definitely keep it on my list to do with my kiddos! 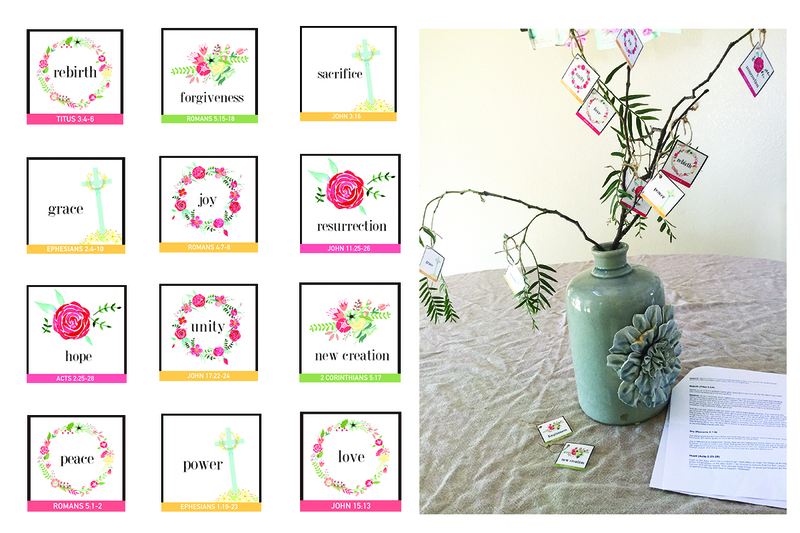 Resurrection Tree – Alicia at Christ-Centered Holidays, came up with a family Easter activity to create a tree by gathering tree branches outside then placing them in a vase. For twelve days, your child will hang one card with a positive word pertaining to Easter on the front, and the Bible verse that refers to it on the back. The parent and child will then discuss each day what the word means by reading the Bible verse. I really think this is such a cool idea because you’re able to have fun with your kids outside by finding the branches together and then you’re teaching your child about Easter by going over Bible verses in a fun way. 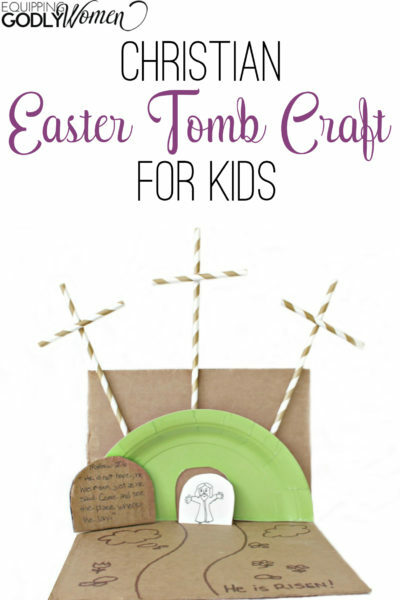 Christian Easter Tomp Craft – Brittany at Equipping Godly Women, came up with a way to create a tomb so that you can teach your child about the death, burial, and resurrection on Jesus. I really like this craft because it’s easy to put together with things you probably have around the house, so you probably wouldn’t need to buy supplies. Basically, it helps you get creative with whatever you have on hand! Resurrection Garden – Beth at 123Homeschool4ME, got creative and decided to make a resurrection garden with her family. This activity will require for you to start at least seven days prior to Easter, so that the grass in the soil can grow. What a fun way to teach your child about Jesus! Cross Fingerprint Craft – Jodi at Meaningful Mama, has created a simple printable of a cross for a paint craft. The idea here is to allow your child or students, to dip their finger in paint then push their fingerprint on the cross, which will represent leaving a unique mark for Christ’s sake. 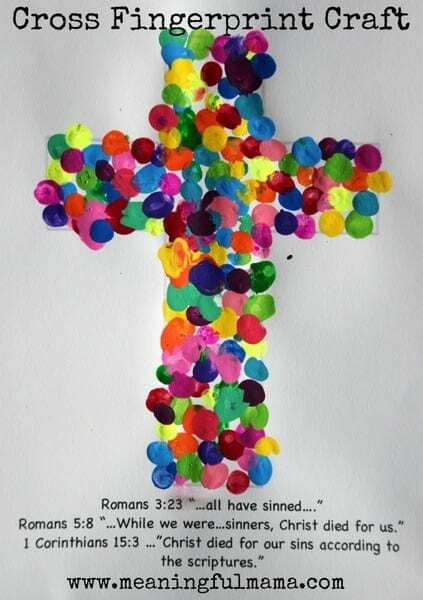 This would be an awesome Easter craft for Sunday school so that each child can participate. Christ-Centered Easter Printables – Angela at Teaching Mama, created a few Easter printables for preschoolers that will give you the opportunity to teach your child the true Easter story. These Christ-centered Easter printables are great because they require for the child to be hands on while learning about Jesus. If you aren’t into the busy crafts that require a lot of materials, then this will probably work well for you. The most you’ll need for this craft is glue, scissors, a pencil, and maybe crayons/color pencils. Easter Cross Wreath – Hannah from Woven Beautiful, was inspired to create an Easter cross wreath made from twigs, twine, and fake flowers. Whether you have toddlers, preteens, or teenagers, this Easter activity is a great way to bond with your child and teach him/her the resurrection story while creating the wreath together. What a great family Easter activity! Christ-Centered Easter Morning Scavenger Hunt – Julie from The Happy Home Fairy, came up with an awesome way to have a scavenger egg hunt that is Christ-centered. She created printable cards with a sentence that describes Jesus’ character as it tells the Easter story. You are to put each printable card in plastic Easter eggs then hide them around the house according to what the cards says. This is such a fun Christ-centered idea!! I will definitely be doing this with my kiddos this Easter! Preschool Craft: Easter Cross – Sarah from In Light of the Truth, did a very simple Easter craft for preschoolers. You would simply draw the shape of a wide cross, put glue on the inside, and allow your child to tear tissue paper and place it on the inside of the cross. This is a simple activity for a Sunday school teacher to teach students about Jesus, or a parent who wants to do a very simple Christian Easter craft. I’m sure my soon to be 3-year-old and 5-year-old will really enjoy tearing up the tissue paper, so we’ll have to try it! Easter Story Stones – Ashley from Faithful Little Hands, came up with a creative way to teach your child the Resurrection Easter story. She has a free printable for you to place stones on that relate to the scripture reference. With the free printable that Ashley provides, you will need eight smooth black stones and a white oil-based sharpie marker. I can’t wait to do this simple East activity with my with my little humans! That’s all I have for now but I’m sure I’ll continually be adding more kids Christian Easter crafts and activities as I find them. I hope you found something from this article that you can use to teach your child about Resurrection Day this Easter! If you’ve come up with your own Christ-centered Easter craft activities, please share in the comments below. Happy Easter! Hey Lani! Aren’t these so great!? I’m definitely going to do the scavenger hunt this Easter. I’m so excited for my kiddos to learn more about Resurrection Day while having fun. Glad you found something from this Easter kids craft list that you can use, and thank you for subscribing! Great post! LOVE IT! Especially the resurrection garden! Will plan to do it with the kids! Thanks so much! Hey Meredith! I know what you mean LOL. Sometimes I’m in a crafty mood and other times…not so much. So this type of Easter craft list comes in handy. Glad you found this helpful! These are great! I love the tissue paper cross, that’s always a fun one. Hi Elizabeth! Yes the tissue paper cross is super simple and perfect for people who don’t like to complicated crafts. These are an excellent way to have fun and talk about your beliefs and the meaning of Easter. Beautiful! Hi Victoria, Yes exactly! It’s all about teaching our children about the love that Jesus has for us and reason we truly celebrate Easter. I love several of these ideas and plan to do them with my kids. Thank you for sharing! Hey Trish! I’m so glad you found this helpful and will be doing some of these Easter crafts and activities with your kids. I’m sure they will love it!